JOHNSON, Albert Walter, a Representative from Pennsylvania; born in Smethport, McKean County, Pa., April 17, 1906; graduated from Smethport High School in 1923; attended the Wharton School of the University of Pennsylvania, 1926-1929; member, Smethport Borough Council, 1933-1934; John B. Stetson University Law School, Deland, Fla., LL.B., 1938; was admitted to the bar in 1939 and began the practice of law in Smethport; member of the State house of representatives, 1947-1963, serving as majority whip in the 1951 session, minority whip in the 1955 session, majority leader in the 1953, 1957, and 1963 sessions, minority leader in the 1959 and 1961 sessions; elected as a Republican, to the Eighty-eighth Congress, by special election, to fill the vacancy caused by the death of United States Representative Leon H. Gavin, and reelected to the six succeeding Congresses (November 5, 1963-January 3, 1977); unsuccessful candidate for reelection to the Ninety-fifth Congress in 1976; died on September 1, 1998, in Boca Raton, Fla.
Ralph Nader Congress Project. 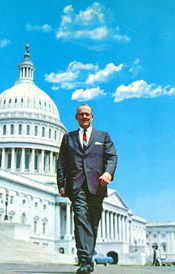 Citizens Look at Congress: Albert W. Johnson, Republican Representative from Pennsylvania. Washington, D. C.: Grossman Publishers, 1972.